Yet the process of bringing the IFEZ into being has destroyed most of the region’s critical tidal flats, a serious situation that has been entirely overlooked. “Reclaiming” coastal land has already destroyed nearly three-quarters of Korea’s original tidal flats. 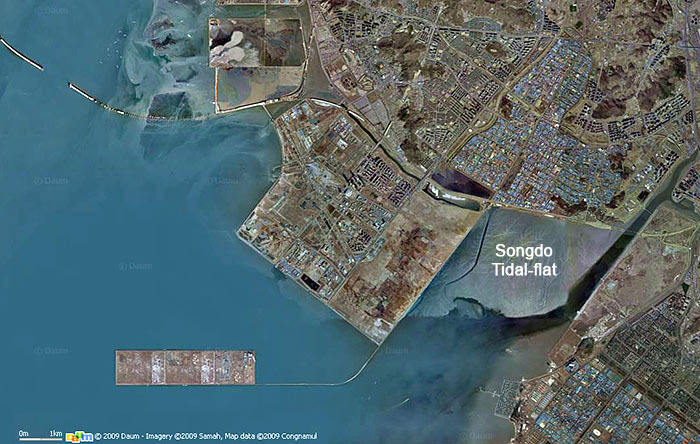 When SAVE began to work on this issue in 2008, an estimated 4,000 hectares of the Songdo Tidal Flats were already gone, and most of the remaining 1,000 hectares were about to be filled. That fragment was the 11th and final section under the overall plan to fill nearly 95% of the original extent of the tidal flats at Songdo. The birds of Songdo are suffering. In 2008, 18,218 shorebirds crowded into this area on their northward migration. Thirteen species of waterbirds feed or nest in this area in “internationally important concentrations”, including Nordmann’s Greenshank, Saunders’s Gull, Black-tailed Godwit, Eastern Oystercatcher, Chinese Egret, and the Black-faced Spoonbill. The organization Birds Korea predicts further population declines in all of these species as a result of the loss of tidal flats. The Black-faced Spoonbill is the rarest spoonbill and one of the rarest birds in the world. In 1990, there were only 300 Black-faced Spoonbills left, making the species critically in danger of extinction. Extraordinary protection and expansion of their winter habitat in Taiwan and Hong Kong have helped the population to increase to over 3,000 birds, but this is not yet a full recovery, and their summer habitat is vulnerable. The spoonbills build their nests on islands off the coasts of North and South Korea, including at Incheon. In a bird count in 2006, fifty-eight spoonbills (about 4% of the global population at the time) were recorded in the remaining 1,000 hectares of tidal flats at Songdo. If the other 4,000 hectares of tidal flat had not been filled for the new city project, Songdo could be supporting an even greater fraction of the population today. Like other industrial second cities around the world, Incheon is trying to step out of the shadow of Seoul, but its ambition is particularly difficult. Such second cities have long done the dirty work for their more famous and glamorous partners, suffering from extraordinary pollution, feeling inferior by comparison and envious by proximity. In the 1970s, Incheon destroyed most of its cultural heritage and natural amenities to accommodate unregulated industrial development, resulting in heavy contamination and a toxic wasteland for a waterfront. Rather than clean up, Incheon began filling the surrounding tidal-flat wetlands in hopes of emerging as one of the must-see cities in the world — a new Chicago, some boosters bragged. Click here to go to Birds Korea’s Report on the Song Do (Songdo) Tidal Flats, Korea. 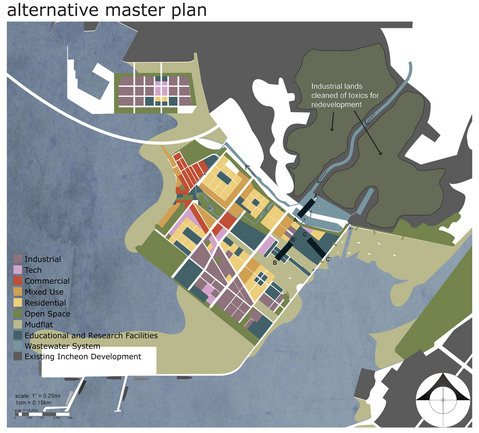 For a further analysis and critique of the plans for Songdo IBD and Songdo International City, please see the article “A Conflict of Greens: Green Development Versus Habitat Preservation – The Case of Incheon, South Korea” by Yekang Ko, Derek K. Schubert, and Randolph T. Hester (Environment magazine, May-June 2011). Besides trying to attract corporate partners, the developers of Songdo have also courted educational institutions from the United States and Europe. Press releases from 2009 and 2010 announced partnerships with the Chadwick School, the State University of New York at Stony Brook (Stony Brook University), North Carolina State University (N.C. State), the University of Missouri, the University of Southern California (USC), George Mason University, the University of Delaware, the Georgia Institute of Technology (Georgia Tech), the University of Illinois, Carnegie Mellon University, Boston University. Stony Brook and N.C. State, as the first two universities induced to join “this hub of education in Asia,” were originally scheduled to open their facilities in 2010 but the estimated date was pushed back. The Chadwick School opened its Songdo campus in 2011. In the case of N.C. State, IFEZ will pick up the entire US$50 million tab. On its own website, N.C. State boasted that it expected to accommodate 3,000 students, and noted that the campus and research lab would be like North Carolina’s Research Triangle Park. No one will confuse the IFEZ with Research Triangle Park, but the free land and facilities, international architectural design competitions, and a global fair that have accompanied the project are too good to pass up. The Songdo Tidal Flats meet the Ramsar Convention’s criteria for wetlands of international importance, but South Korea is refusing to nominate them. It is shocking that any American university would open a campus on land whose very creation (“reclamation”) would be illegal under Ramsar criteria, U.S. coastal best-management practices, or state regulations. Certainly North Carolina State, Stony Brook, and the other schools, if they were expanding their home campuses, would abide by the laws that protect fisheries, local economies, and biological diversity in their own state. Maybe they just didn’t know, but colleges are the last place one might accept ignorance as an excuse. 5. repair the proposed campus area to shorebird habitat. Additionally, any university that considers locating in Korea (or elsewhere around the world, for that matter) should first do its own comparative research on human rights and environmental policy; in this case, the research would particularly focus on conservation biology, the Black-faced Spoonbill, and other endangered species. Why, for example, can the spoonbills find no better place to hatch their babies than the sewage lake in Incheon? Research might also focus on South Korea’s highly advanced capacity for ecological double-talk, whereby outmoded and destructive engineering practices are clothed in the latest green vocabulary, such as its “Green New Deal”. The success with which Korea deceives foreign investors and its own populace is fertile ground for study. Far more productive research, though, would focus on the best ways to repair and restore habitat at Songdo and other tidal flats. Start with the very campuses that Stony Brook and North Carolina State seek to occupy, by shrinking the campus footprint and repairing the remaining filled wetlands. These universities might also study the economics of filling wetlands to provide the “free” incentives that attracted them in the first place. Gale International and its partners must be held accountable, but for now, the universities planning to move into Songdo have a grave responsibility and exceptional clout to save the Black-faced Spoonbill and the other threatened species. Their students and alumni should be especially keen to follow the story, but the entire world is about to learn something. The universities have to decide what lesson they will teach us. SAVE International has been developing parallel campaigns to ask the universities to reconsider their actions, and our planners have developed alternatives for the use of this area. Click here for the a 2011 list of corporations and universities whose facilities would be located on the Songdo Wetlands (PDF). Gale International has also been trying to certify Songdo IBD as a neighborhood that exemplifies environmental responsibility, under the U.S. Green Building Council’s Leadership in Energy and Environmental Design for Neighborhood Development (LEED-ND) program, but such a certification seems uncertain. Songdo IBD could certainly earn points under LEED-ND for some thoughtful features of the urban design, and individual buildings have even been certified under LEED-NC (-New Construction). The developer has hired consultants YR&G Sustainability and prominent international engineering firm Parsons Brinckerhoff to help prepare the LEED-ND application. Although Songdo IBD is registered under the LEED-ND Pilot Program, merely being registered does not convey any environmental merit. In a 2010 interview, Sophie Lambert, the Director of LEED-ND for USGBC, said that the pilot program accepted all applicants: “Projects were not selected.” Only actual certification shows that a project has met the criteria of LEED-ND. Nevertheless, most members of the public and most investors may not understand this nuance, so they could easily mistake “registered in the LEED-ND Pilot Program” to mean “certified under the LEED-ND Pilot Program”. LEED-ND certification for Songdo IBD may be a hard case to make, because of two particular prerequisites under the “Smart Location & Linkage” (SLL) category. Environmental policies and agencies in South Korea are different from those in the U.S., but it is not clear whether Songdo IBD actually met these prerequisites. You can read the full rating system for pilot projects here (click to open link). Songdo IBD would be illegal to build under United States law, but some Americans are contributing to it. In building the new city, they are destroying the Songdo Tidal Flats, the ecological services that those wetlands used to provide (such as water purification and carbon sequestration), and endangered wildlife that depend on healthy tidal flats. Gale International and its consultants might have chosen to retrofit parts of Incheon itself into a smart city, but building a new city over the Songdo Tidal Flats appeared to be a cheaper option. 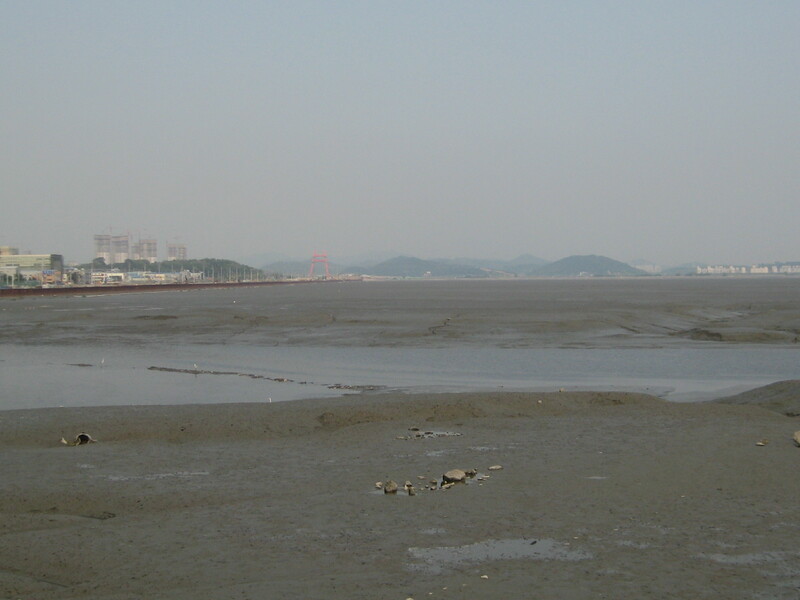 Since South Korea did not have strong laws for protecting wetlands, no one was forcing Gale or its consultants to account for the existing benefits of the intact tidal flats. Professional engineers, however, are obliged to act ethically and should educate clients who do not understand that natural places already provide public benefits. Fundamental Canon 1 of the Code of Ethics of the American Society of Civil Engineers (ASCE), for example, requires engineers to “strive to comply with the principles of sustainable development in the performance of their professional duties”, with the definition of sustainable development including “maintaining the availability of the remaining natural resources”. Songdo IBD and the larger IFEZ project, having made the natural resources of the Songdo Tidal Flats less available, are not sustainable development. Incheon Metropolitan City has been considering four options for expanding or replacing the existing Seunggi wastewater-treatment plant (sewage-treatment plant). One of four options would involve filling part of Namdong Reservoir, where hundreds of Black-faced Spoonbills have been nesting in recent years on the artificial island. 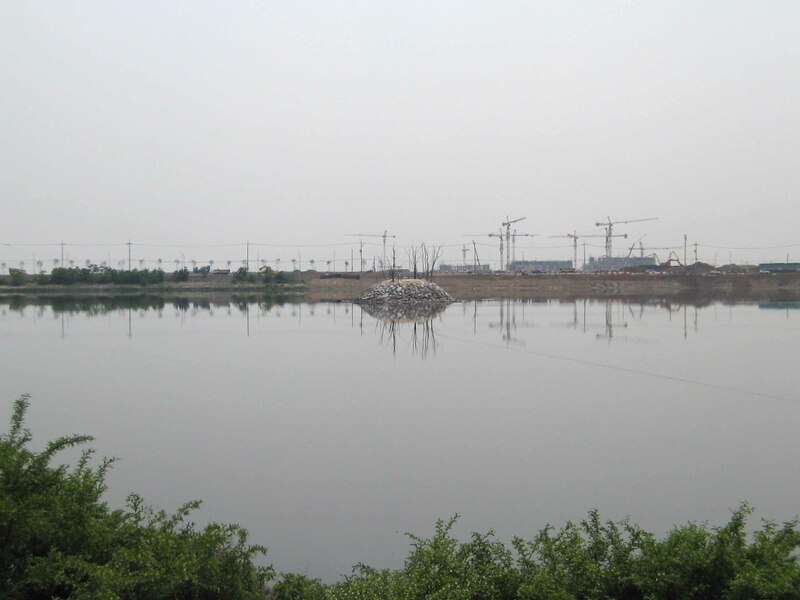 Although the Incheon branch of KFEM told us in late 2015 that the city had conducted a feasibility study in 2014 and favored the option of rebuilding the facilities underground, but had not ruled out the option of building on the reservoir. Seunggi sewage plant and effects on birds (PDF). Several concerned groups have been watching the situation and writing letters to officials in Incheon, urging those officials to protect the birds and rule out building on the reservoir. The group include Incheon BFS Network (lead contact: Sunjeong Nam), Japan BFS Network (lead contact: Satoru Matsumoto), and Hong Kong Bird Watching Society (HKBWS) (lead contact: Yat-tung Yu). They have also urged other environmental groups to send their own letters and add more voices to their call. The case of Namdong Reservoir and the Songdo Tidal Flats became even more urgent in July 2016, when members of the Incheon BFS Network found 37 birds dead of an apparent botulism outbreak. (None of the birds were spoonbills, but the outbreak echoes the death of 73 spoonbills from botulism at the Tseng-wen Estuary in Taiwan in the winter of 2002-2003.) The loss of habitat and the ensuing decline in water quality seem to be putting the birds under stress.